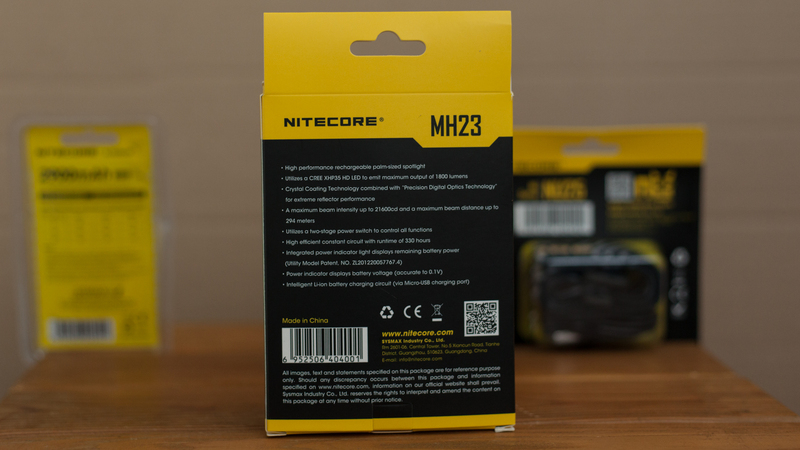 Nitecore MH23 was provided by Nitecore for review. 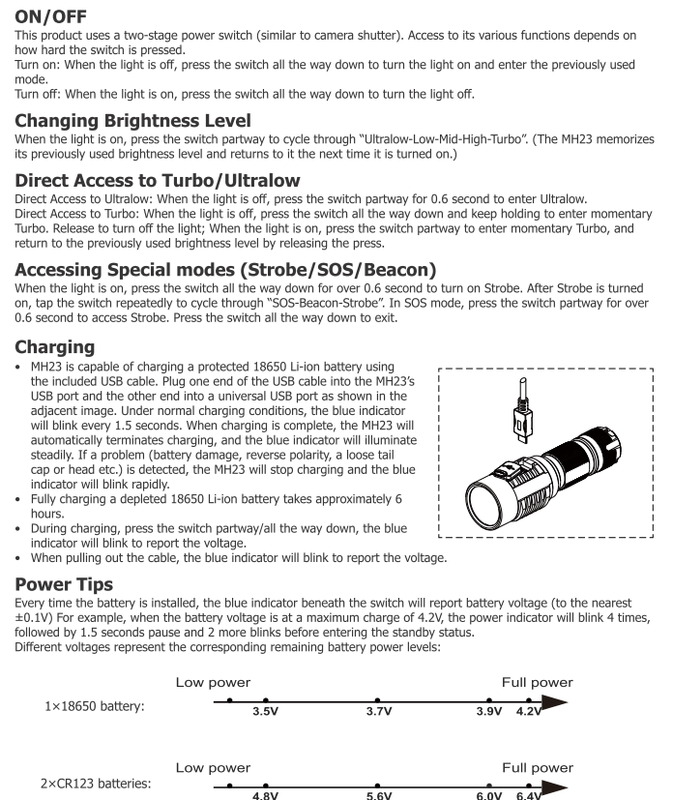 Here is flashlight page at manufactuurer website. 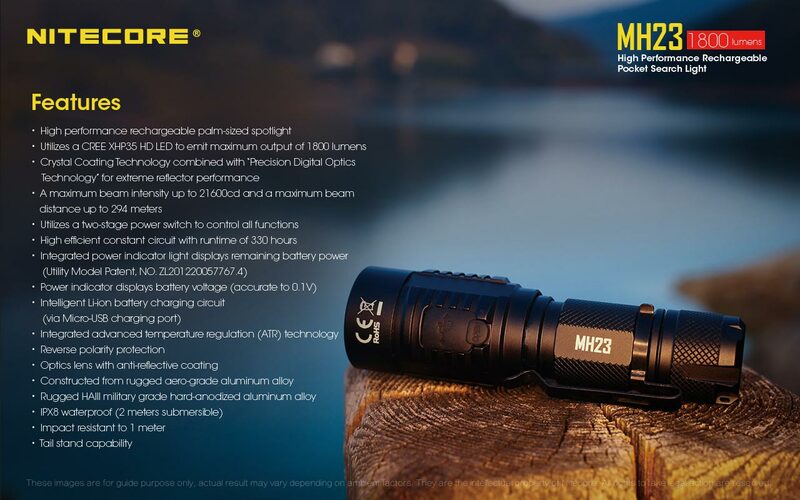 MH20, predecessor of this model was really good and innovative light at the moment of release. 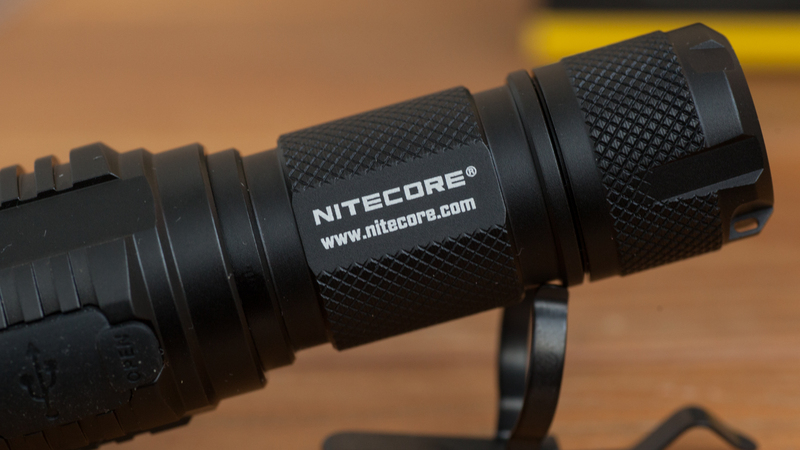 I consider it to be one of the best EDC lights back in those time and it is still interesting after 3 years. 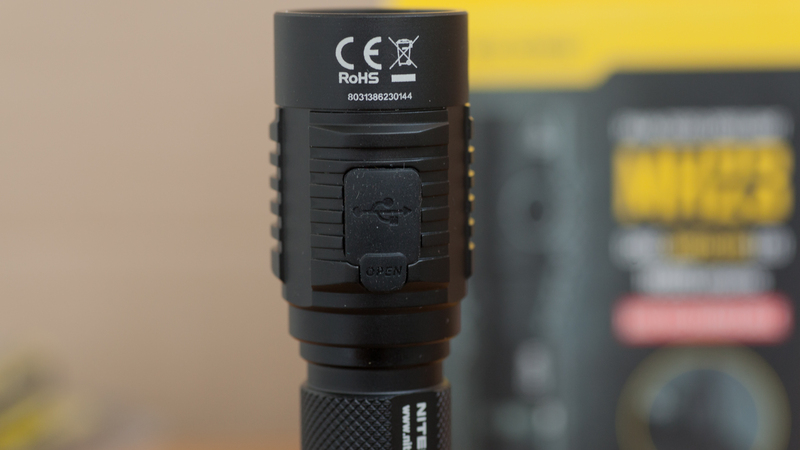 Compact, bright (remember that in 2015 year 1000 lumen was a seriously BIG number for EDC light), it had so rare micro-USB charging port and innovative 2-position button. Omg, so much good words, but MH20 totally deserves them. 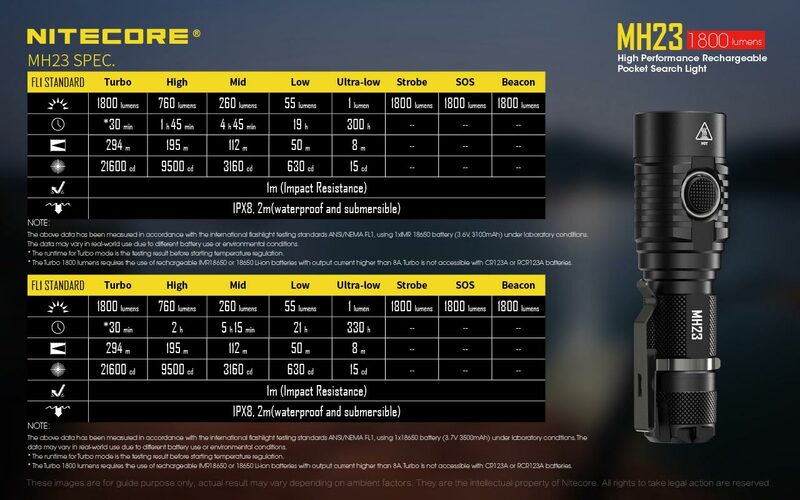 After 3 years Nitecore decided to refresh this model and released MH23 and kindly sent it for review. The same well-known yellow-black box that we all know. Design and print are good, expectable for A-level brand. 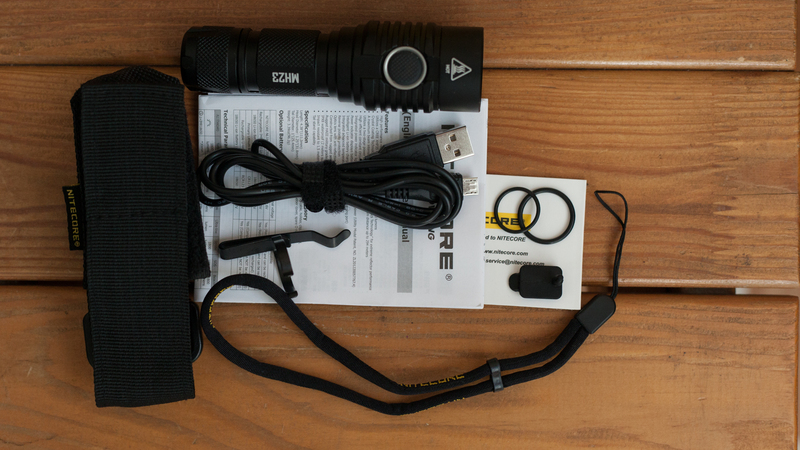 Package includes: MH23, lanyard, holster, USB-charge cable, clip, 2 smaller\bigger o-rings, manual and warranty. 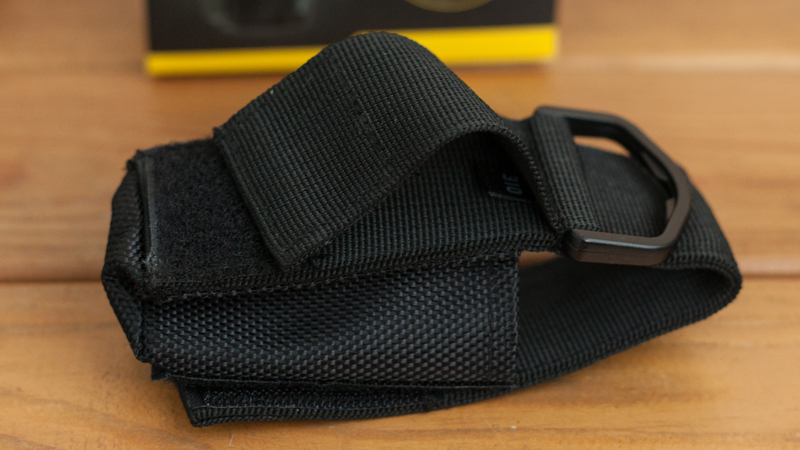 Holster is good, I like Velcro at the back that enables to quickly attach holster to belt. So, here it is. 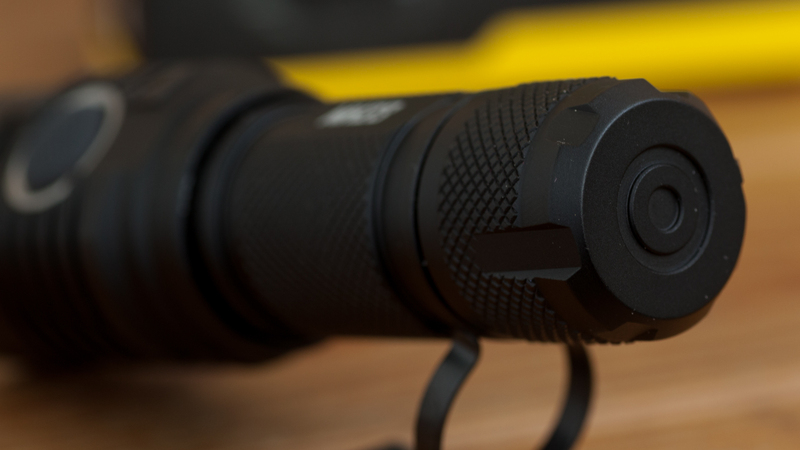 Compact flashlight, that looks good and feels good in hand. 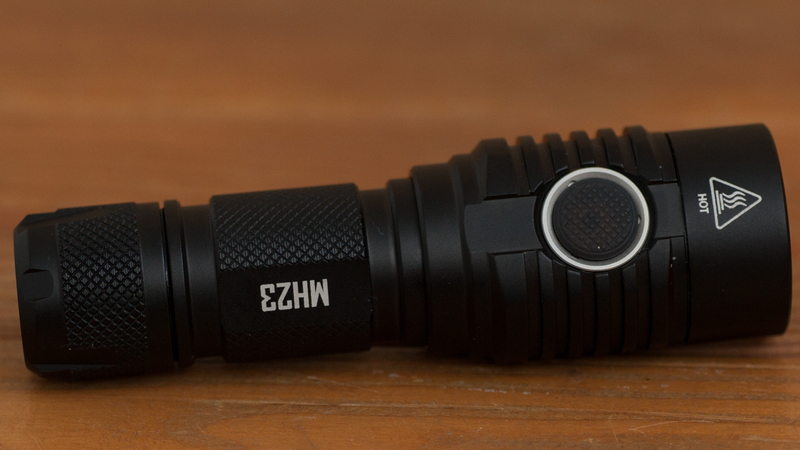 Size is 100% EDC, just 96g (without battery), 11cm long and 3cm in head diameter, so it`ll fit any pocket. For me personally, MH23 reminds P30, it fits hand similarly. 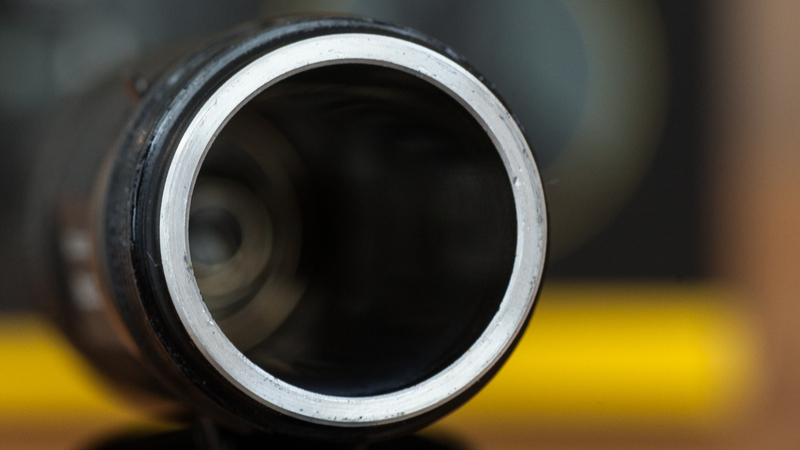 Detail matters, and clip is that detail. 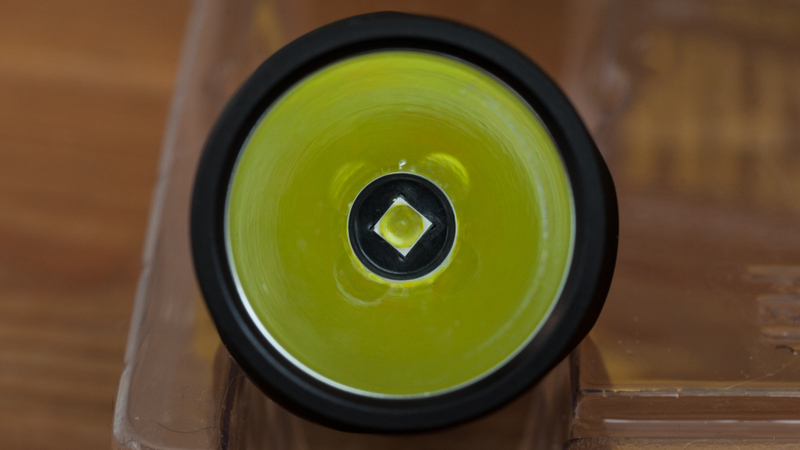 I met a lot of lights with too tight clip that scratched anodizing and were impossible to detach. Here it is reasonably tight. 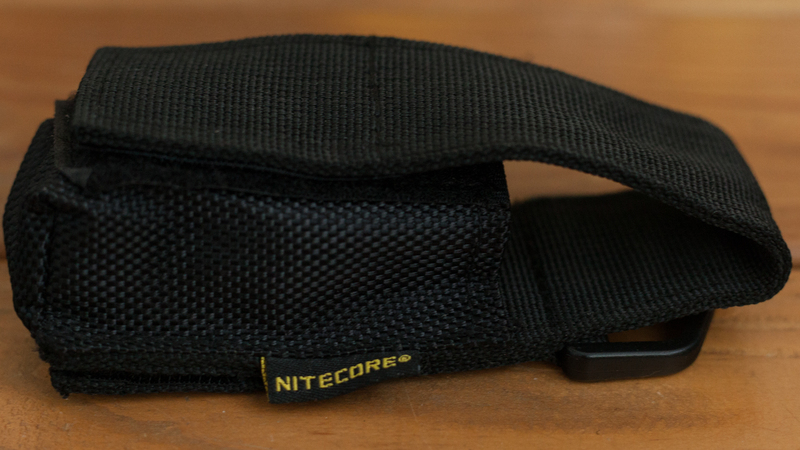 It holds tight on body and can be attached and detached without excessive power. BTW, anodizing is good as well. Another thing I like in this clip is that it can be attached in 3 positions. But if you attach it at head, you can only position clip into 2 “trenches”. You can clearly see last ones on the photo of head. There is 3rd trench that can fit clip, but in this case it will be almost impossible to press button. 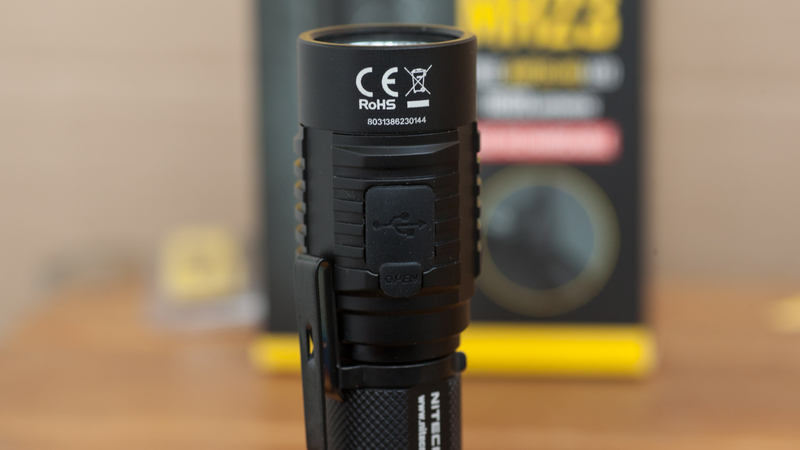 May be that can be useful in matter of locking flashlight. I`d t prefer traditionally place clip at tail, on the opposite side from button, so last one will always be under finger, well-known trick for blind find button. 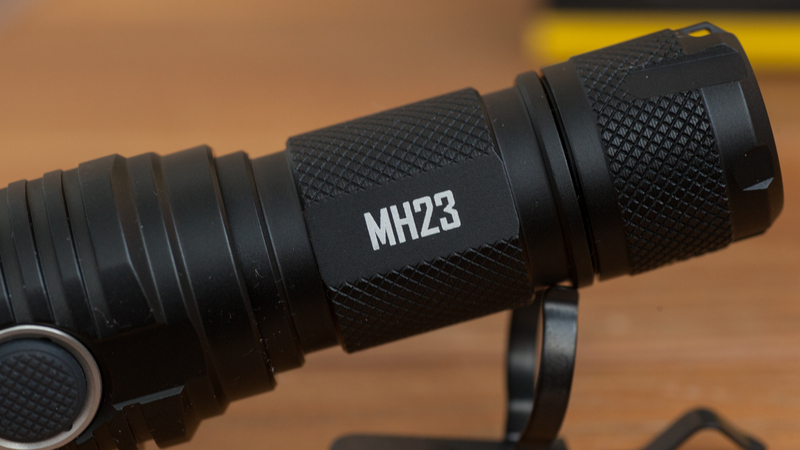 MH23 can be disassembled into 3 pieces. You can clearly see a lots of lubrication on thread. They are quite big and tailcap easily and smoothly glides on them. What about tailcap, it has some flat sides, that helps a lot to unscrew it even with gloves on, to change battery in cold weather outside for example. Small eye for lanyard. 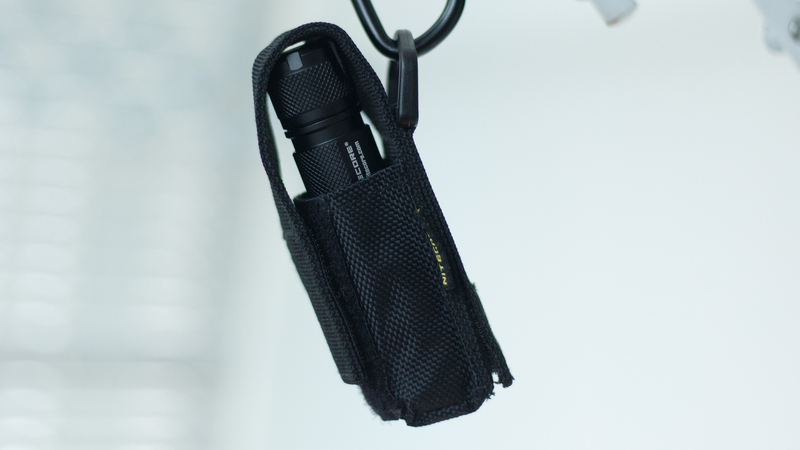 You can attach lanyard to clip as well, as usually. And thick are walls, 2mm. 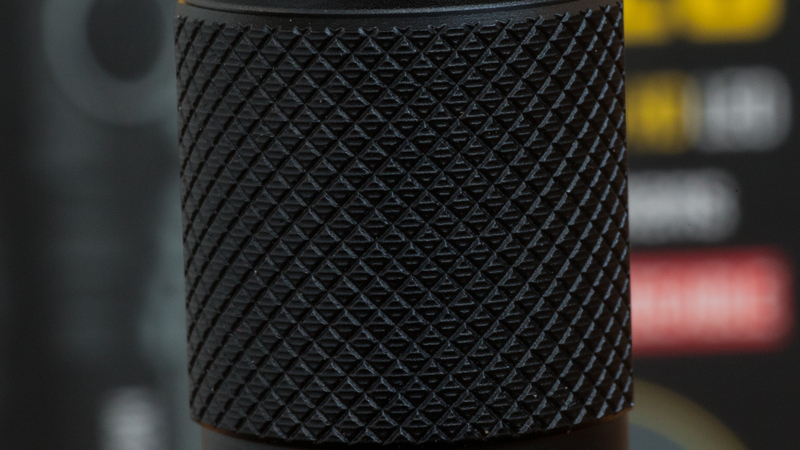 Knurling is small, rhombic. 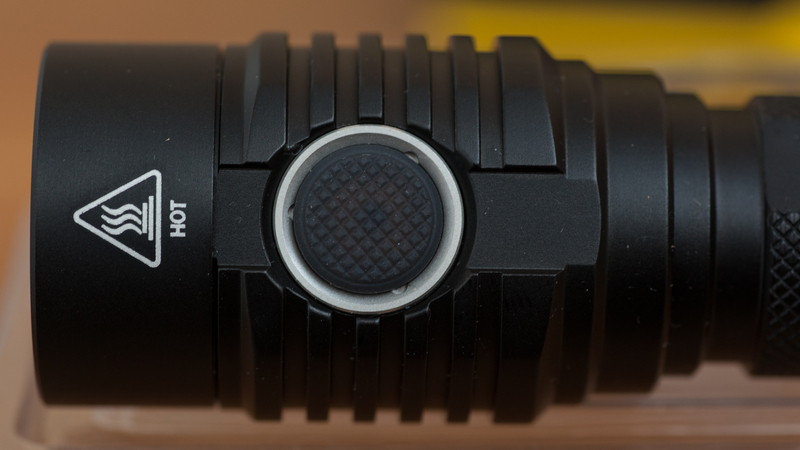 But shape of flashlight determines good grip: fingers cover cooling ribs or “trenches” for clip and hold flashlight tight. And if clip is attaches, grip is concrete solid. As usually, model name and brand name are placed at the flat opposite sides of body. 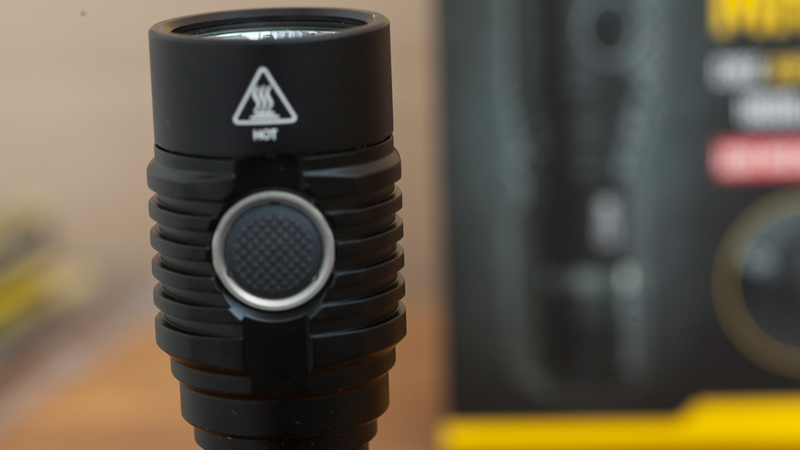 There are no spring from head side, which is not crucial for EDC light. Sometimes that results in supporting only button-top batteries, but not now, MH23 works fine with flat top. Head looks big, comparing to body, but in reality it is just 31mm wide, definitely not that much at all. There are a lot of cooling ribs, and those ribs are deep and good. I`ve mentioned that head reminds me of P30? Last one is a decent compact thrower, with only one problem – small button. Here MH 23 gets really, really good sized button that finger finds easily. And to ease this finds, indicator in button (a feature that we quickly got used to), also serves as locator, slowly blinking blue. 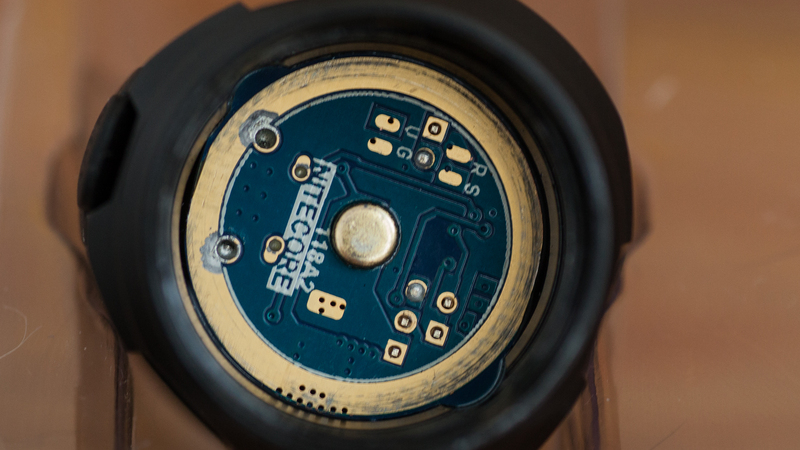 Nitecore says it can work 6 months in this “button beacon” mode, which is more than enough. As usually, charge port is located at the opposite side from button. This port is really deep, and that is cool in matter of waterproofness. 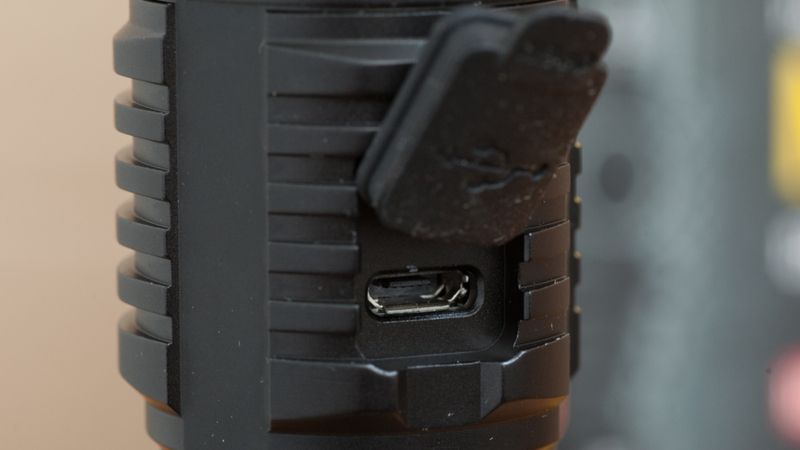 Rubber plug is thick and fits charge port really tight. 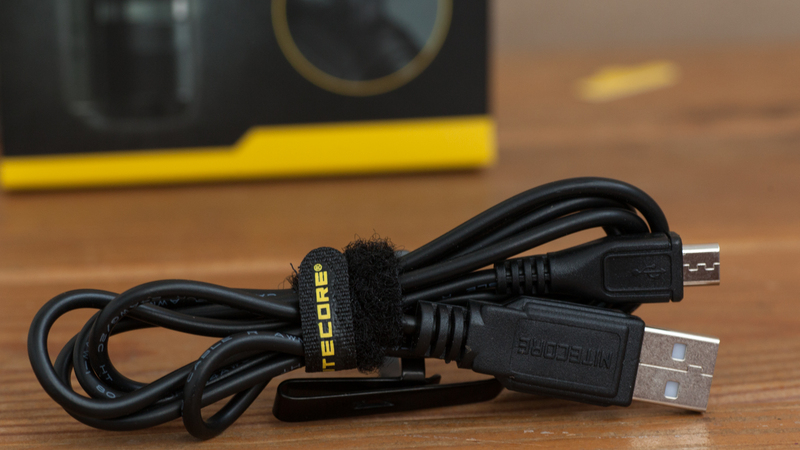 Ah, yeah, micro-USB charge cable. 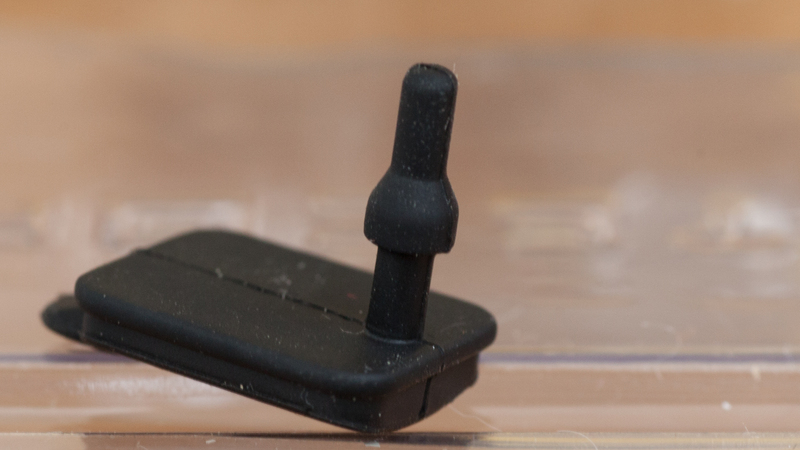 1st time I see that manufacturer added a spare rubber plug. Heh, my daughter torn that little stuff apart from another flashlight couple of times, I was really pissed off, but managed to stick plug back both times. If she lost it, that would be a serious problem. Spare plug is a cheap but really user-friendly addition. Smooth bezels seems to be glued. I couldn’t unscrew it. 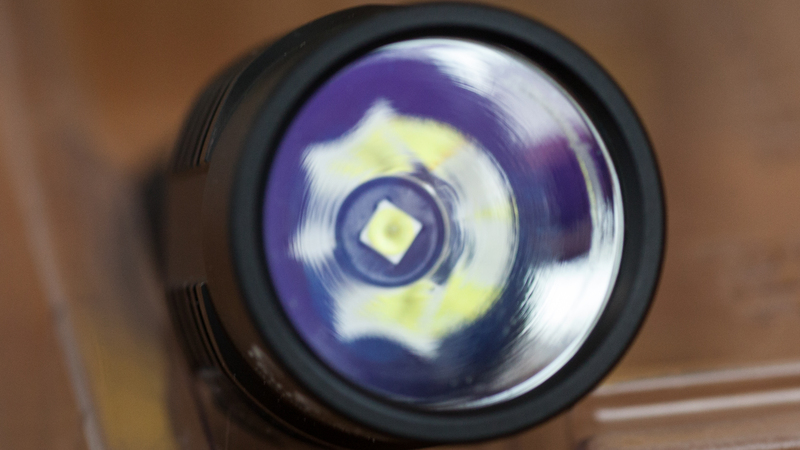 Reflector is 26mm wide, and I suppose 25mm deep. Good ratio for every day needs throwing. Glass is OP coated. My overall impression about appeance is totally positive. MH23 looks good, and fits hand the same. I don’t see any visible bugs in build quality. Well, i`m not surpised ( in good way). 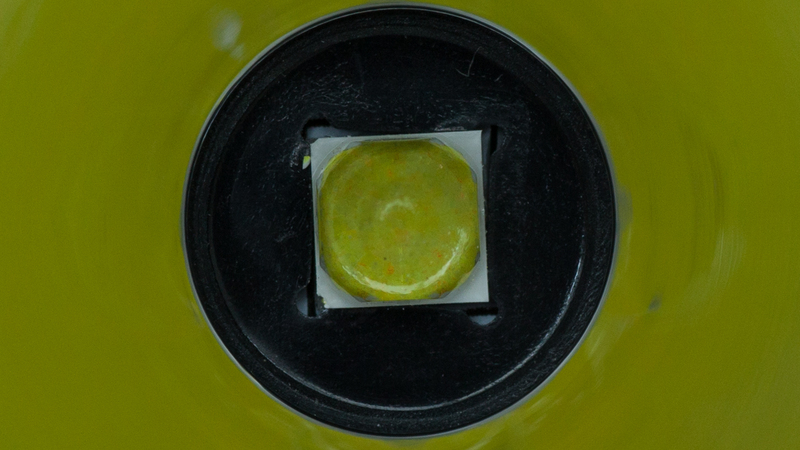 Button here works like button in photocamera, has 2 positions. I bet there are those guys among readers who own MH20 with same UI, please share your opinion. Anyway, user has access to all the modes with only one button , that`s cool. You only need to get used to it, as UI is really flexible for one-button. The only feature that MH23 lacks in UI is lock in\out. 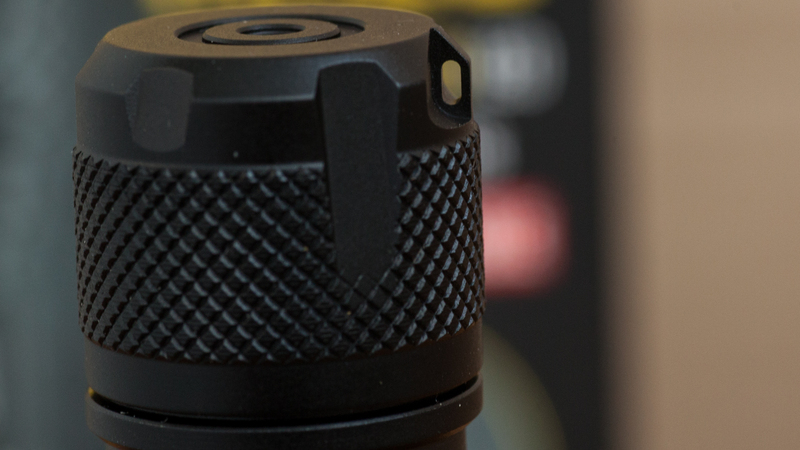 But you can easily unscrew tailcap little bit at get you flashlight locked. nevertheless, it took me just minutes to get used to it. CW light, MH23 successfully passed pencil\shower test for PWM-shimmering. 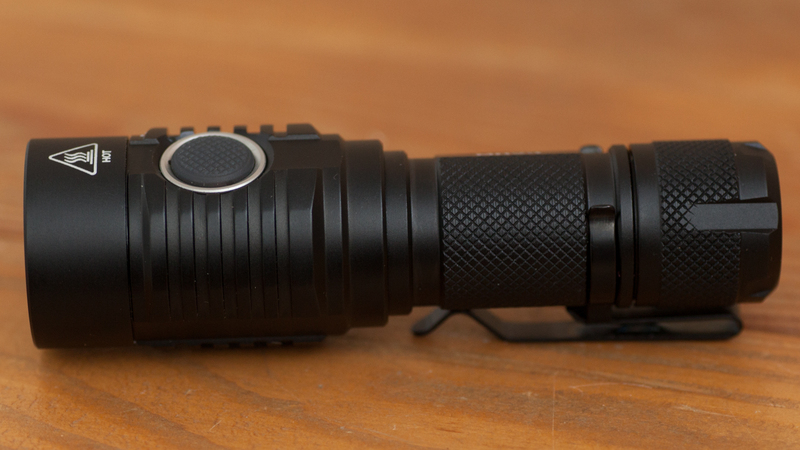 Light distribution is good for EDC needs, more throwy for mid range, than floody for close range. MH23`s throw is good enough for absolutely any regular need. 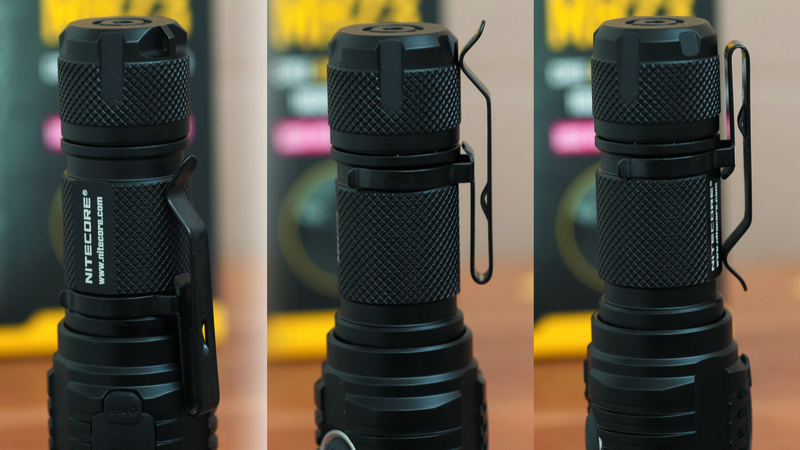 Just compare it with EC22, which has 100% typical EDC reflector: small and OP. 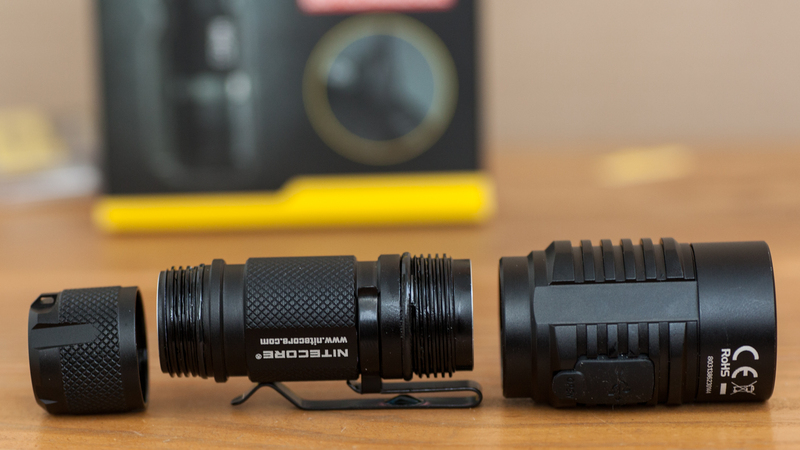 BTW, may be Nitecore offers 2 versions, with OP\SMO reflector for any taste? Emm, charge amperage is the same as it was with MH20 – 0.5A, which is low number nowadays. Times has cometh to see runtime chart. And these numbers show that stepdown is seriously quick, stabilizing at somewhere 65% with slow further decrease. 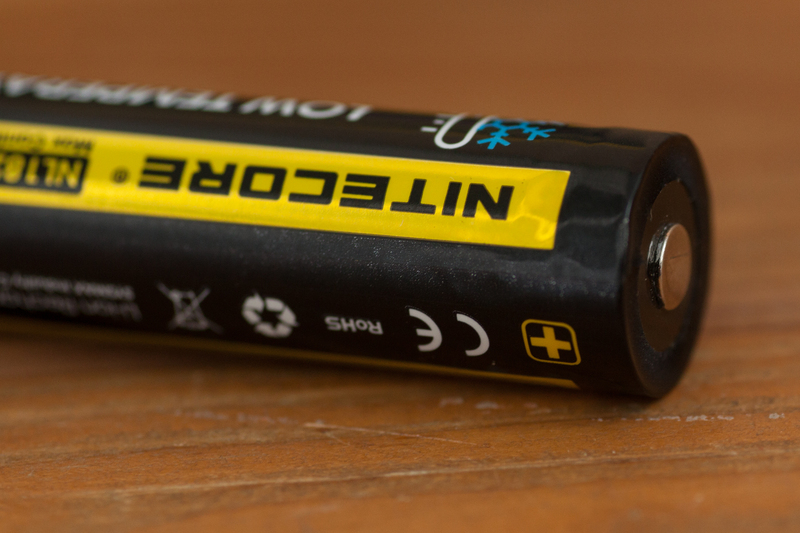 I tried with some batteries, with\without cooling – result is the same. 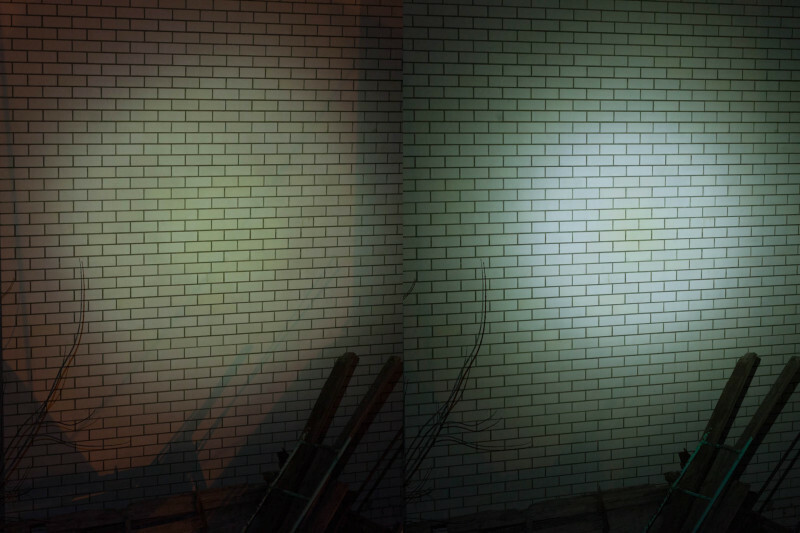 Nevertheless, this brightness level is also decent for compact flashlight, I want to remind you that MH20 has turbo that was significantly less. Other modes are also well stabilized. 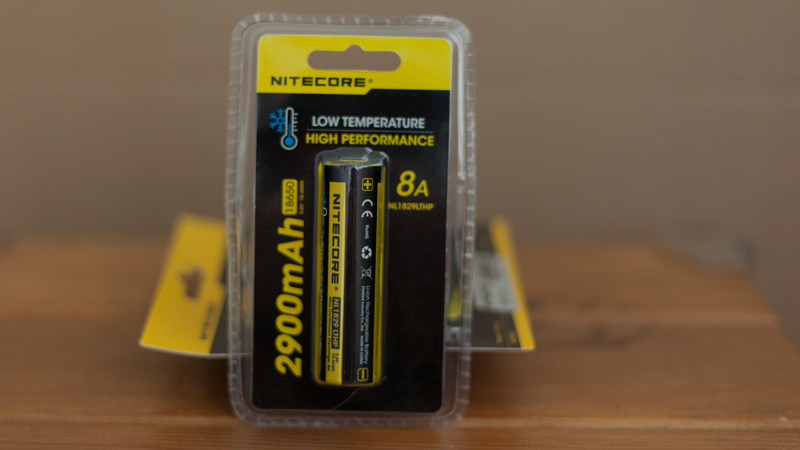 Yeah, Nitecore added new 18650 battery. This one has new chemistry that should perform well in deep cold. I put it into freezer, land of everlasting -20 celcius, frozen meet and thought about old albums of “Immortal”. 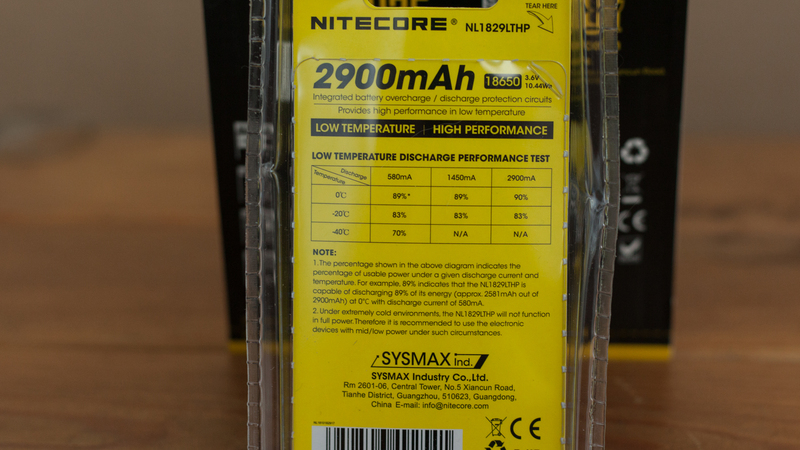 So, I inserted it into Liitotakala 500, “norm test” and got little bit over 2400mah. In room temperature test show stated capacity as well. I chose a pair distances, typical for EDC flashlight use, about 15 and about 30-60meters away from me. 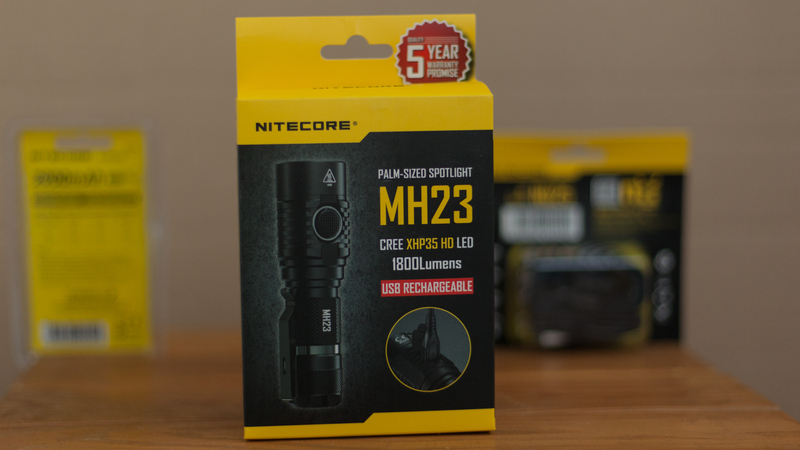 At both distance, Nitecore MH23 gives convenient light. 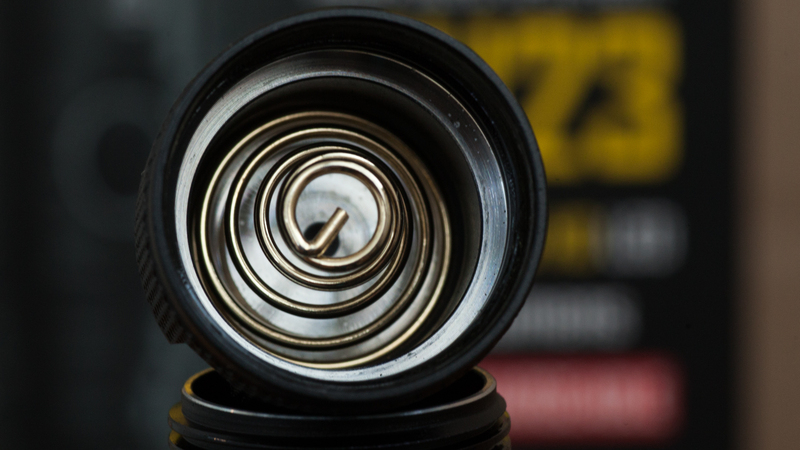 For the rest, MH23 has decent throw for its size, throw that`ll be enough for most of common needs. I`d limit that throw with about 200m range. Here is my video-review as well. At the end of it there is part with flashlight performing alive, i managed to find settings of camera which made video really close to what eyes see. 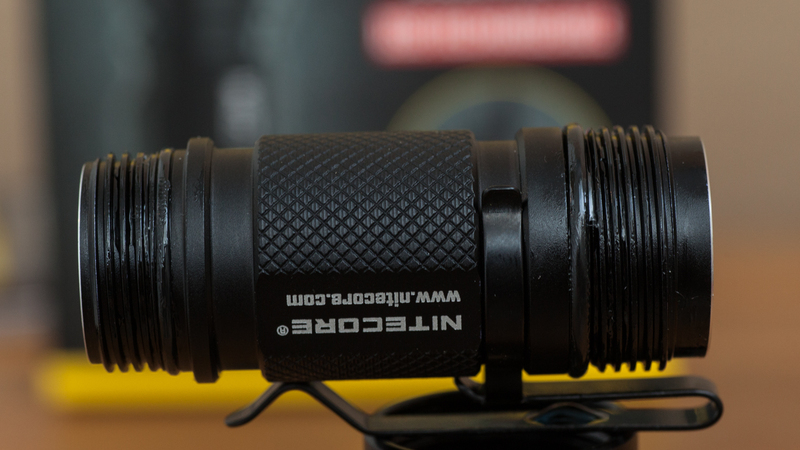 + good light, with reasonable set of modes. any way to turn off the blue indicator light?